The origins of the Harvard Public Library date back to the late eighteenth century when the Reverend William Emerson, father of Ralph Waldo, started a social library association. The organization languished after his departure in 1799, but in 1808, shareholders organized the Social Library of Harvard with shares assessed at $2.00. The librarian/custodian was chosen yearly, the honor going to the lowest bidder at auction. The location of the Library also changed as frequently as its custodians. By 1846, interest in the Social Library had dwindled and under the aegis of Augustus J. Sawyer the Library was reorganized and continued in operation until 1856. In that year the Social Library took advantage of enabling legislation passed in 1851 and offered the town its book collection to be the basis of a free public library if the town would agree to vote $100 per annum to support the library. 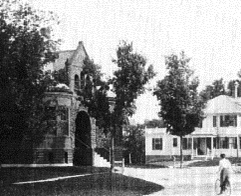 The town so voted and the Harvard Public Library was created. It was open one day a week, Thursday afternoon and evening. Though Harvard had a public library, that library had no permanent home for another three decades. New England history is replete with tales of young men who left the hill and made good elsewhere. In the 1880s, the Harvard Public Library was the beneficiary of several such. The Honorable Edward Lawrence of Charlestown died in 1880 and remembered Harvard in his will, probated in 1885. He left the library $5,000, $4,000 of which was to be a trust, the income of which would be for book purchases. 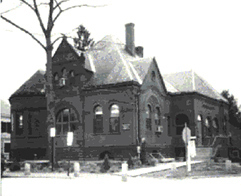 At the time of the bequest, the town was supporting the Library with $200 yearly. A year after Mr. Lawrence's death, the Library's longtime friend, Augustus Sawyer died. It had been his intention to remember the Library, and his widow, Hannah, did so in her will the following year. Mrs. Sawyer left the residue of her estate for the purchase of the land and the erecting of a permanent home for the Library. Thus in 1886, Town Meeting appropriated $3,500 to add to a like amount from Mrs. Sawyer's estate. Land was purchased and a building under way at 7 Fairbank Street. The architect, William Channing Whitney of Minneapolis, another Harvard native, gave his services to the town. At this time, Warren Hapgood, a retired Boston merchant originally from Harvard, gave the town $2,500 for the building program. 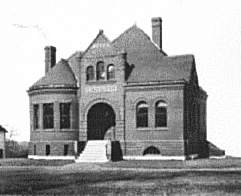 Construction started on August 2, 1886 and the building was dedicated June 22, 1887. The total cost of the land and building was $10,472.71. The new building housed not only the Library, but also the Harvard Post Office. There were no changes to the building until 1902 when a bequest from Warren Hapgood made possible an addition for the children's department and a large meeting room which bears his name. From 1902 to the present, the town's population grew together with the Library's collection, services and circulation. In 1956, the Post Office moved to new quarters, yet by the late 1970s it was apparent that the expansion or replacement of the Library was crucial. The Trustees hired the Wellesley firm of Architect Design II in 1980 to draw remodeling plans for the existing building. At Town Meeting in 1981, the Library presented plans that maintained the integrity and feeling of the old building. In 1982, the Town voted for an expansion and remodeling program which was completed in 1983. As a result of the building program, usable space was increased and the installation of an elevator made the building handicapped accessible. The success of the remodeling resulted in an increase in demand for services, increased patronage, and the ability to properly develop the collection. The Trustees met many of these challenges through the use of trust funds. During the 1980s Harvard’s population grew such that by the early 1990s, it was apparent that additional space was needed to meet the town’s library needs. In 1999, a New Library Building Committee was formed to develop the design for a library facility to serve well into the next century. With considerable Town participation, and the services of the award winning architectural firm, CBT/Childs Bertram Tseckares, Inc., a building grant was prepared to locate a new library at the heart of the town center by restoring and adding to Old Bromfield. At the 2001 Annual Town Meeting, the Town overwhelmingly approved the submission of the grant to the Massachusetts Board of Library Commissioners. In June 2001, Harvard was notified that the grant was accepted and approved for the maximum State financial support of $2,490,000, which became available in 2004. The new Harvard Public Library construction project restored the Old Bromfield building which first opened in 1878 as the Bromfield School. The building was designed by Peabody and Stearns and constructed with a grant from the estate of Margaret Bromfield Blanchard. Generations of the town’s children passed through its doors until it closed in 2003. In 2007 the original building, with an 11,500 square-foot addition, reopened as the town’s new public library. The renovation preserves the building into its next century, and the addition perpetuates and expands the educational, civic and recreational qualities of the library.